I am right there with you on this WHOLE post! I had that playset as a kid, remember it so well. I loved it. And staying at a real Holiday Inn when I was about 17 for the first time was mainly because I wanted to experience it. Nothing really special other than the memories, but yeah, the vintage signs/logos rock so much more than these bland new ones. THANK YOU for this post & those pics! That is so cute! I totally loved Legos as a kid- and probably would now also. Perfect gift for the constant traveler who never grew up. Hey, that's me! haha, i totally remember those!! and i agree with you about loving old logos. i love the old toy! i can see why you prefer the vintage feel, but i do think the new logo is more fresh and updated! I have a book about vintage Motels & Hotels. Holiday Inn practically "invented" the art form of kitchy motel signs. They were the first to use the crazy arrow and neon. After that everyone was trying to out-do each other and they got wilder and wilder. I cannot believe that they would turn their back on that type of history. Boooooo. It's funny that you wrote about this since vintage logo tees are all the rage. I bought a Fanta shirt yesterday. People at work think the shirt looks cool, but I still look like a dork. Baby steps I guess. 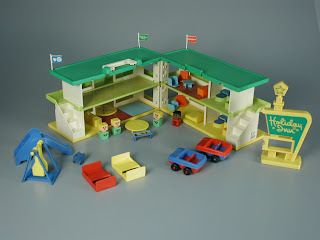 i adore that holiday inn fp playset! thanks for sharing. Kind of like "If it ain't broke don't fix it" right??? Yeah if the log was working why change it??? I've stayed in many an old Holiday Inn and I thought they always had a "scent." Wait a sec...they have a signature smell?? I work for a property management company and we actually own a Holiday Inn. I am going to have to ask the powers that be about the scent thing! I agree the new logo is crap. Makes it look cheap in my opinion. I suddenly have the urge to play with legos....and there are none around here. Does anyone have a kid (with legos) that I can borrow? Growing up we never stayed at the Holiday Inn because my parents thought they were too expensive. Guess that's why I was happy when we spent our wedding night at one! found your blog "by accident", and want you to know I grew up in the 70's, 80's, and 90's in Floral Park and Garden City! Going through your posts is a trip - the Franklin Square McDonalds! LOL! I'm just not a fan of Holiday Inns in general. Or hotels for that matter. But I do like the older logo better. Well, of course you love the vintage. I like their old style too. I had that the Holiday Inn Playskool playset as a kid. I for one hated the new logo. I almost included it in a post I did for my blog on old corporate logo's versus new ones. New marketing and design just doesn't seem fresh and creative anymore. And what's with all the shortening of names? KFC.. BK.. IHOP.. Geezaloo! I wish that I had that playset when I was a kid. My brother and I had the airport, farm and house. I don't care for the new logo either. We used to have a Holiday Inn near us but they tore it down and put a Shop Rite there. I miss seeing it. I like the vintage look too! Sometimes it's okay to not update everything. Hint, hint company advertising team.